" 'Vital signs' are, of course, the basic physiological measures of functioning which health practitioners use to assess the gravity of a patient s predicament. This anthology focuses not so much on our physical predicament, with so many of the Earth's systems severely stressed and beginning to fail - there are plenty of other places to read about this. Instead we focus on our psychological predicament, as news of the situation slowly penetrates our defences and we struggle as individuals and as a society to find an adequate response. By 'vital signs' we also mean signs that such a response is beginning to take shape: signs of hope, signs of healing. We feel that ecopsychology in Britain has a distinctive voice and unique contributions to make. In doing so, we hope to facilitate debate and dialogue within the field, in the hope that this will lead eventually to more developed theory and practice. Things are still at quite an early stage in the construction of ecopsychology as a discipline, and the articulation of relationships of compatibility or incompatibility between various approaches. It will take time for the field to reach maturity, to agree on terminology (or agree to use different terminologies), and to develop organisational forms. This is a familiar process for any new way of looking at things. At the same time as recognising this slow maturation, we are of course equally aware of the extraordinary urgency of the external situation which it is one of the missions of ecopsychologists to address. While there would in theory still be an important role for ecopsychology if we were not facing environmental meltdown - exploring the complex relationships between human and other-than-human, and the therapeutic value of bringing the two together - in practice ecopsychology has been completely shaped by a sense of catastrophic loss, of the irreversible destruction of complexity and the impending threat to the systems which sustain life on this planet. 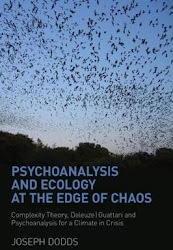 From this point of view, ecopsychology is part of a much larger movement seeking to develop awareness of climate change together with all the other developing ecological crises (pollution, over-consumption of resources, destruction of habitats, etc). What distinguishes ecopsychology from many of the other players in this larger movement, however - apart from the psychological focus itself - is a very widespread perception of human beings as just one element in the global ecosystem; and an agreement, both ethical and practical, that humanity cannot save itself by throwing other species out of the sledge. The ecosystem stands or falls as a whole, human, other-than-human, and more-than-human; and a failure to recognise this is itself a symptom of our culture's dissociation from its place in the larger whole, which is one of the causal factors leading to our current situation. Among people who have been working in this area for some time, there is a growing question: what if we fail? What if our society does not manage a transition to a carbon-free economy - and all of the other transformations of culture and practice which are required alongside this? In all probability time is getting extremely short; considerable damage to global ecosystems is already certain, and runaway 'tipping point' effects are predicted by many scientists. Although awareness of this crisis is far greater than it was a decade ago, there is still little sign of a serious shift in public attitudes. Indeed in the UK, and elsewhere, ecological concerns have been eclipsed by the recent economic crisis with seemingly little recognition that of course ecological, social and economic crisis are completely interwoven. While the future can never be predicted with certainty, there is not much concrete basis for optimism. What then?"